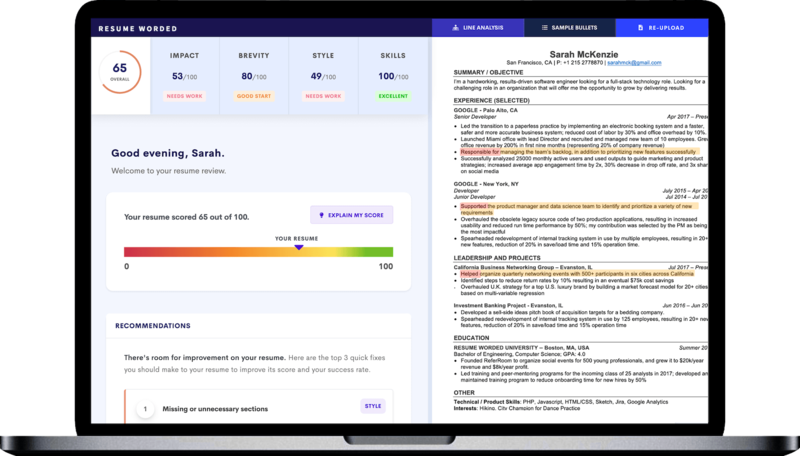 Our AI-powered resume and LinkedIn optimization platform saves you time, increases efficiency, and enables you to help more clients achieve their career goals. Resume Worded allows you to grow your coaching business and help more clients in less time. Our AI-powered platform lets your clients improve their resumes and LinkedIn profiles themselves. This frees up your time to focus on where you add the most value (i.e. resume targeting, interviews, career planning & strategy). Our platform empowers you to expand your business's reach and take on new clients, wherever they are. Get your clients more opportunities and interviews to jobs they want. With Resume Worded, you can get instant feedback on your clients' resumes and LinkedIn profiles via Score My Resume and LinkedIn Review. Our proven tools identify gaps and suggest improvements to ensure your clients get found on LinkedIn and have a resume that hiring managers love. Become the career coach your clients will remember and refer their network to. Differentiate your business from every other career coach or counsellor. Take advantage of our flagship AI-powered technologies to not only drive efficiencies in your business, but also provide unmatched insights and availability to your clients. Upload your clients' resumes and get detailed personalised feedback on each with our AI scoring algorithms. Your clients can also upload their resumes themselves. As a coach, you can track your client's resume and LinkedIn profile scores, access their feedback, and monitor engagement levels to identify clients that need the most help. We know how hard resume writing can be. That's why we give you and your clients access to 250+ resume lines that real candidates used to get into top companies & 50+ metrics across all industries. Get professional Word templates vetted by recruiters and are optimized to pass ATS and recruitment software. Our AI-powered engine scores and analyzes your clients' LinkedIn profiles, identifying intelligent insights to generate more opportunities for your clients. Our entire platform has been designed using inputs from top recruiters and hiring managers. Ensure your clients achieve their career goals. This is a great tool to get some benchmark advice and save a lot of time. I've been visiting Resume Worded for a long time since it was first hunted here. It helped me improve my CV so much. Since I'm actively looking for a job now, I'm more than ever visiting the site, highly recommend it! While these other apps are telling you what you need to include in your document, they don’t necessarily teach you how to describe your achievements. That’s what Resume Worded is for. The templates section is AWESOME. More helpful than my colleges career development center! We've helped over 50,000 jobseekers thus far - we know our solutions work. All our tools are freemium, so if you'd like to give them a go before you join us, you can try them out for free! Click on any one of the products below to get taken to the free version. Get personalised feedback with our AI-powered scoring engine. Get tailored feedback on how to get your client seen on LinkedIn. Get in touch with one of the founding members. We're happy to answer any questions you might have, and show you how we can help scale up your coaching business.